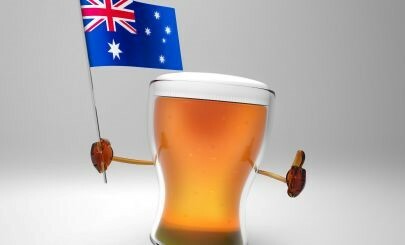 With a shift in drinking habits, discerning Australians have now got choices if they want to wake up and feel better! Not only are Aussies aware of the number of standard drinks they are allowed for driving but they are also tending to chase beers with lower carbs. The younger generation in particular are becoming more health conscious and are seeking beers with lower alcohol content and calories. As there is nothing more than a refreshing cold beer or two in this sun drenched nation, piling on the weight can easily happen. Australian beer companies are making a great effort to put on their bottles all the information needed to control intake. A standard drink is how much alcohol the average person can process in one hour. The process cannot be sped up and your body can only deal with one drink at a time. So, if you have three standard drinks, it will take three hours for your body to process them. Alcohol will affect your ability to drive. If you are drinking and driving the rule of thumb for an average 70kg male is no more than two standard drinks in the first hour and one standard drink each hour after that. For a 50kg female there should be no more than one standard drink per hour. In Australia it is an offence to drive while your blood alcohol concentration is 0.05 or above. So with Australia’s relationship with alcohol changing, the low carb and alcohol beer industry is growing. Low to mid strength beers are becoming more popular to cool ‘ya on a hot day! Pure Blonde White Lager was the first low carb beer to be introduced into Australia! Since its introduction in 2004 Carlton & United Breweries has continued to produce lager with the same full flavour and refreshment in three styles, Pure Blonde White Lager, Pure Blonde Premium Lager and Pure Blonde Naked Lager. Pure Blonde White lager has 70% less carbohydrates than other lagers on the market and appeals to both male and female drinkers. Even though the market now has far lower carb beers to choose from Pure Blonde White lager remains Australia’s most popular choice. 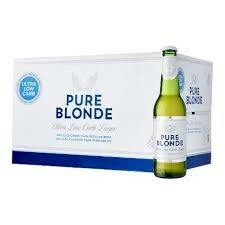 Pure Blonde is light, crisp, aromatic and brewed with the finest ingredients and with no preservatives. This easy drinking lager is pale amber with a bright golden glow and subdued foam. The Pure Blonde Premium Lager is brewed to the true blonde style. This contemporary lager is a mid-strength brew with 67 calories per bottle and 80% less calories than regular beer and 3% alcohol by volume. The lager has a light bitterness and delicate finish. Pure Blonde Naked has a great flavour which is clean, fresh and not excessively carbonated. Low in calories it is a mid-strength beer with 3.5% alcohol by volume. Even though Pure Blonde varieties are made with malted barley, which contains gluten the brewing process breaks down the Gluten and has 1mg per 100g with is helps customers with gluten allergies. On a hot and humid Aussie day ice cold XXXX GOLD is a refreshing mid strength beer that hits the spot! This iconic brew a few years back took the number one spot off Victoria Bitter, as the number one beer to be sold in Australia. Very popular in the state of Queensland manufactured by Castlemaine Perkins and is brewed in Queensland with the finest Australian malt, barley and a unique golden cluster hops . XXXX GOLD is clear, bright gold-yellow in colour with moderate carbonation and about a centimetre of head. The beer’s smell is of malt lager, and the taste is well balanced with a smooth yet complimentary bitterness with a sweetness from the extra malt. XXXX Gold has only 109 calories per bottle so it is a lower carb beer. As a mid-strength beer sitting at 3.5%, a 375ml bottle equals as one standard drink allowing the consumer to manage their alcohol intake. As the welcome introduction to the stronger XXXX Bitter, Aussies can have 2 bottles in the first hour then one every hour after that meaning they can still drive home without the risk of losing their licence for two years. A good reason why this beer being popular for people on the move! Victoria Bitter is has long been one of the highest selling and Australia’s favourite, full strength beer with 4.9% alcohol by volume and 146 calories per 375ml. It has been quenching hard earned thirsts for decades having been brewed by Thomas Aitken who developed the recipe in since 1854. 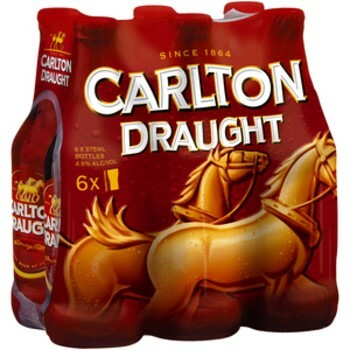 Now produced by Carlton & United Beverages, a subsidiary of Foster’s Group in Melbourne Victoria. VB is widely known as rewarding Australians who work hard delivering its full flavour when ice cold. For the seasoned drinker, it is the perfect beer for the Australian climate and it is affectionately known as Very Best, Victory Beer or amusingly less flattering names like Vile Brew. VB is not actually a bitter it is a lager which is fuller and bitterer than European lagers. The crisp, clean hop bitterness is complimented by the fruity hint of banana in the aroma. 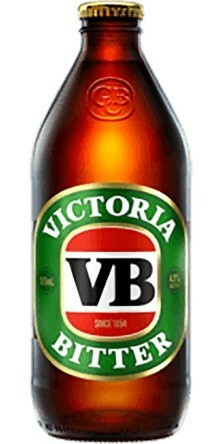 It has a golden yellow colour with a stiff white head that quickly dissipates, medium body and a good deal of carbonation, VB delivers a flavour like no other and is a classic Australian lager. 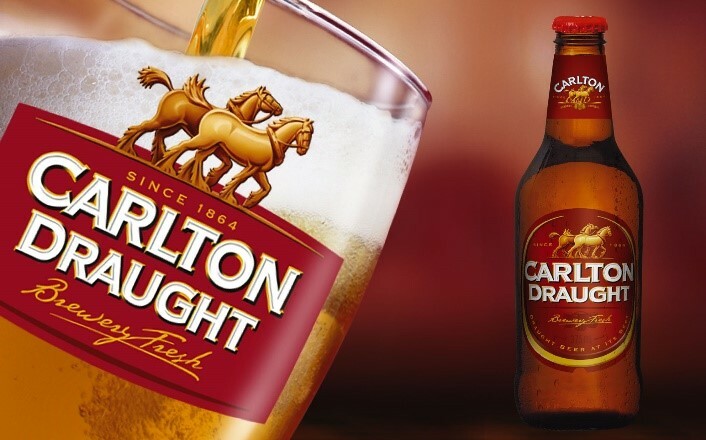 Carlton Draught is a perfect example of Victorian beer history and is one of Australia’s biggest selling beers. It is made by Carlton & United Breweries and is a traditional full strength lager with 4.6% alcohol volume and 138 calories per 375ml. It has long been a comfortable fit for drinkers who know exactly what they are getting into with consistency in taste that has been important to Australians for generations. Renowned for delivering a brewery fresh taste, it is sold in bottles and cans as well as being sold as a draught lager on tap nationally. It appeals to many drinkers due to its crisp mid palate flavour yet full hop bitterness and slightly dry finish. When poured it has a golden colour with a good head. Its aroma has a good malt character with a medium low carbonation. This easy drinking lager is another legendary creation of beer craftsmanship! Owned by New Zealand Lion Nathan beverages company it is brewed in Lidcombe, New South Wales and can be found anywhere on tap at almost any bar in NSW. This full strength lager has 4.6% alcohol volume and 142 calories per 375ml. The balance of smooth malt character and a delicate hop aroma is perfectly suited to an Australian BBQ and Australia’s hot climate. It has transformed taste buds across the nation and it is very popular in NSW bars. The beer started out in the 1930’s with the name Tooheys New Special. Called “new” because bottom-fermented (lager) brewing was introduced in Australia a few decades after top fermenting brewing. Then in 1970’s they stated calling it Tooheys New Special Draught in bottles and cans before deciding the name was too long and it was shortened to Tooheys Draught. Then from public opinion that Tooheys New was the same beer with to different names! 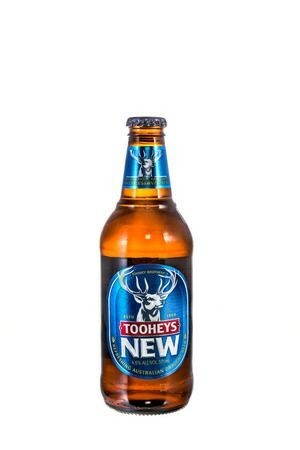 It was called Tooheys New from 1998.The beer with a stag on it! Tooheys New White Stag is a full strength beer with alcohol by volume of 4.6% and 104 calories. Closely resembling the taste of the original White Stag, this brew uses Munich malt and is brewed longer than usual. The beer has a slightly ‘hoppy’ taste and aroma to balance the malt flavour. It is a good low carb beer for people who are not really into low carb beers to it and still want to have full strength alcohol. Tooheys Extra Dry, known as TED, is a refreshing dry lager brewed by Lion in the Tooheys Brewery at Lidcombe NSW. With 4.4% alcohol by volume and 121 calories, it has 30% less carbs than ordinary beer. 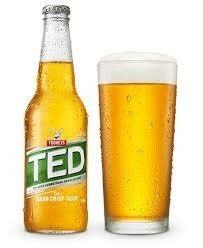 TED is a wonderfully fruity lager with malty notes and a crisp, dry finish. This pale golden ale has an uncommonly resilient head for this type of dry beer and has medium to higher carbonation. The crisp, dry finish is achieved by an extended fermentation period, which leads to minimal residual fermentation sugars being present. Again as with Tooheys New, it is a legend beer with a stag on it! This uncomplicated beer quietly slides across the palate and is perfect for the Aussie climate. If served slightly cold the enjoyment of the subtle flavours of yeast and malt are enjoyed, with the added advantage of the lower calories. Carlton Mid Strength beer is mid strength beer that is loaded to the brim with flavour. Brewed by Carlton& United Beverages, it has 3% alcohol by volume and 135 calories per 375ml. A unique process that uses traditional bittering hops and top quality hop extracts combine to give this beer a delightful hop flavour. Pouring a clear deep gold in colour it is crisp, lightly bitter with some roasted malt tones and a frothy head. The muted malt flavours give it perfect balance and drinkability. Carton Mid was 3.5% ABV and since it has changed to 3% some Australians think of it as a light strength beer rather than a mid-strength as it is now 0.9 standards of a drink. Carlton Dry is a refreshing full strength lager with a clean crisp finish and low carbohydrates. 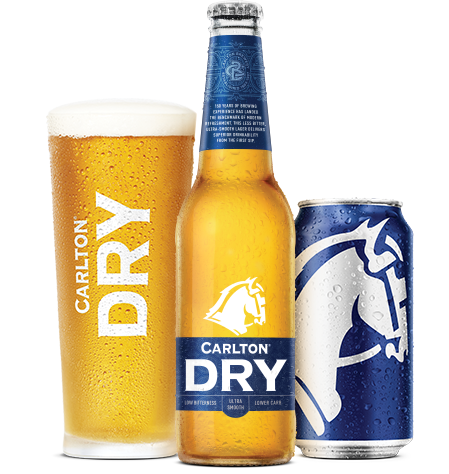 As Carlton Mid, Carlton Dry is brewed by Carlton & United Beverages. It has 4.5% alcohol by volume and 117 calories. Carlton Dry’s extended brewing process removes excess sugars so the final product is lower in carbohydrates without compromising the strength. Specifically brewed for easy drinking the beer has a great taste with a smooth dry finish which is perfect drinking in the summer sunshine, a barbie or equally at home. There has been a shift to Carlton Dry, particularly in female customers and the younger generation as they search out beers with lower carbs. Brewed by Carlton & United Breweries, Crown lager has become one of Australia’s most iconic brands and a classic in its own right. Special care has been taken to select only the choicest Australian barley and the best Pride of Ringwood hops, in an extended process which creates the premium beer. 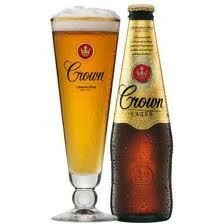 Crown lager has an understated elegance with a distinctive taste. It is light gold in appearance with good carbonation and a stronger smell than the average macro lager. It has a creamy taste which is fruity, malty and with a crisp clean hop finish. Edging towards a traditional pilsner rather than a lager, Australian’s enjoy a ‘Crowny’ even though it is slightly overpriced! 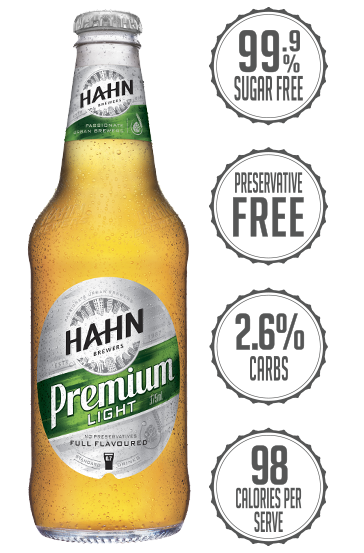 Hahn Premium Light is a superior, light in alcohol, preservative free beer that doesn’t compromise on taste and flavour. Brewed with the best modern techniques by Hahn Brewing Company in Camperdown NSW, it delivers full flavour and refreshment. With less alcohol than Hahn Superdry, Hahn Superdry 3.5 and Hahn Ultra, it has won internationally recognised awards and is Australia’s favourite premium light lager. Hahn Superdry is the original beer, born 20 or so years ago for the modern Aussie beer drinker, having 4.6% alcohol by volume. It is refreshingly crisp and has a unique dry taste achieved by brewing the finest ingredients for an unusually long time. A preservative free beer with 0.7% carbs preserve means it has 70% less carbs than regular beer and is 99.9% sugar free. Hahn Superdry 3.5 has 3.5% alcohol and 78 calories per serve, so is a little lighter than the original brew. It offers the same unique deliciously full flavoured taste with a crisp and dry edge. Hahn Ultra has only 45 calories per serve and with 0.9% alcohol it is just 0.2 of a standard drink. It tastes just as refreshing as the other Hahn varieties and is crisp, light with a low bitterness and floral hop aroma.